Samsung Bada 2.0 was unveiled on February in the mobile world congress. The Bada 2.0 SDK, launched yesterday by Samsung is Samsung’s own OS, and apparently they have been working alot to make it competitive. Bada 2.0 comes with features such as multitasking, wifi direct, NFC(Near field communication) and voice recognition. It enables smartphone users to experience advanced services such as mobile payment, transport pass-card recharge and file sharing without Internet networking. A key feature for developer partners is the introduction of In-app Ads. Using the Ads API (Application Programming Interface) developers for bada 2.0 can easily insert advertisements, creating new revenue opportunities. 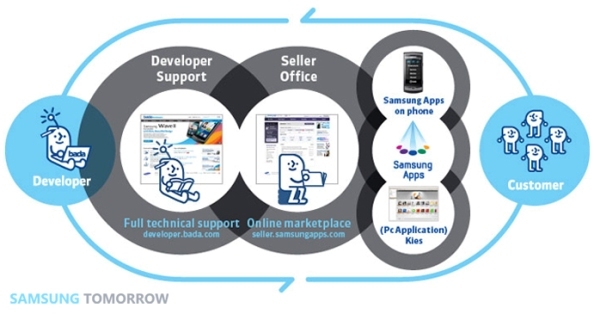 Samsung has also upgraded and strengthened its application development environment, providing developers with increased support. An Emulator has been added to foster a development process suitable to the target environment. Tools such asProfiler optimize the device’s performance ensuring that resources like memory and processing power are used to their fullest capacity. Samsung Apps retail store has been revamped and is now available in 121 countries worldwide and has added new purchasing options, I think the mobile payments will be an option in the store. So expect three new Wave powered devices ranging from affordable entry level devices to smartphones to be launched in the next few weeks. Bada 2.0 SDK is available for download for developers.